Gov. 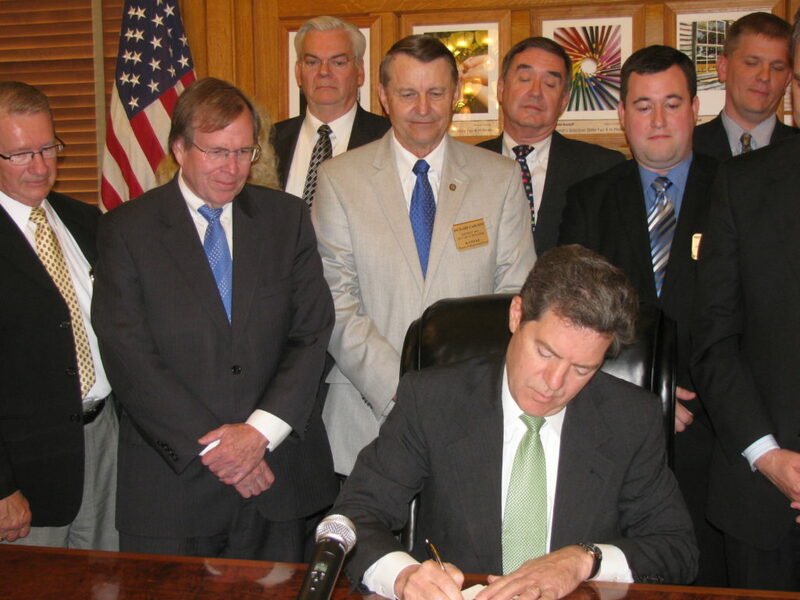 Sam Brownback on Tuesday signs into law tax cuts with supporters looking on. The bill cutting taxes awaiting Gov. Sam Brownback signature. Topeka ? Gov. Sam Brownback on Tuesday signed into law massive tax cuts that he says will boost the economy and create jobs. 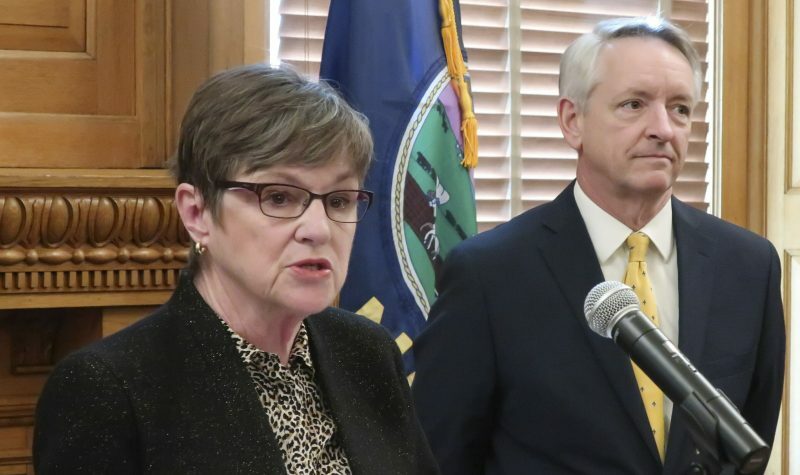 “Today’s legislation will create tens of thousands of new jobs and help make Kansas the best place in America to start and grow a small business,” said Brownback, a conservative Republican who made tax cuts his top goal of the 2012 legislative session. “My faith is in the people of Kansas, not the government’s ability to tax and redistribute,” he said. Brownback’s action came under harsh criticism from Republicans, Democrats and advocates for schools and children. House Minority Leader Paul Davis, D-Lawrence, said the tax cuts will devastate state government. “The recklessness of Gov. 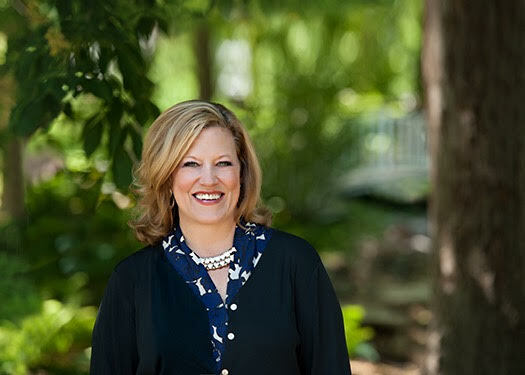 Brownback’s actions are sure to result in deeper cuts to our public schools, more disabled Kansans left without critical services, and higher property taxes,” Davis said. Brownback’s signature on House Bill 2117 will do away with the three state income tax rates of 3.5 percent, 6.25 percent and 6.45 percent, and replace them with two rates, 3 percent and 4.9 percent. The measure will eliminate income taxes for the owners of 191,000 businesses that are limited liability corporations, subchapter S corporations and sole proprietorships. It also increases the standard deduction amount for single head-of-household filers from $4,500 to $9,000, and for married taxpayers filing jointly from $6,000 to $9,000. In addition, an already scheduled reduction of the state sales tax from 6.3 percent to 5.7 percent will take effect next year. All told, tax revenue is projected to decline $4.5 billion over the next six years, raising concerns from many about the impact such a reduction will have on the state budget, which totals about $6.2 billion in state revenue annually and sustained significant cuts during the recession. The Legislature’s research staff forecast that the tax cuts would lead to a budget shortfall by July 2014 that could grow to a range of $2.5 billion to $3 billion by July 2018. Asked to respond to those criticisms, Brownback vowed the state will meet the needs of schools, the most vulnerable Kansans and will build roads. He said cuts will have to be made in the budget. At the bill signing ceremony, Brownback was joined by members of his Cabinet, a handful of legislators and representatives of the Kansas Policy Institute and Americans for Prosperity, groups that have been calling for tax cuts, less government spending and linked to Wichita-based Koch Industries. Critics of the tax cut have said the measure would benefit many large businesses, such as Koch Industries, at the expense of low income wage earners. 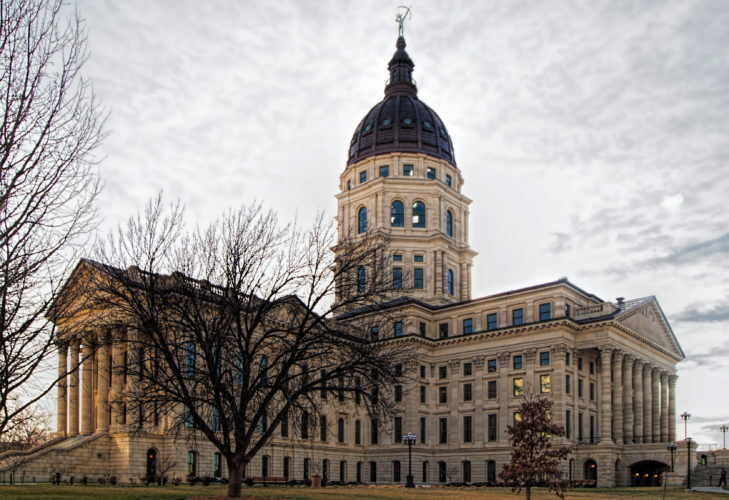 The Kansas Policy Institute distributed a paper that said the state’s general revenue fund would continue to have a positive balance if the state instituted one-time cuts of 6.5 percent and experienced 1.5 percent annual revenue growth. Brownback’s office said “dynamic projections” show the new law will result in 22,900 new jobs, give $2 billion more in disposable income and increase population by 35,740 people. But an analysis by the Kansas Economic Progress Council shows that to try to recover the lost revenue through increased sales tax collections, Kansas would need to add nearly 500,000 new jobs each paying $50,000. That is equivalent to a 50 percent increase in jobs in six years. Business groups, however, lauded Brownback’s action. “Gov. Brownback’s decision to sign this legislation shows that he’s serious about growing the Kansas economy and making our state the best place for small businesses to locate and grow,” said Dan Murray, Kansas state director of the National Federation of Independent Business. 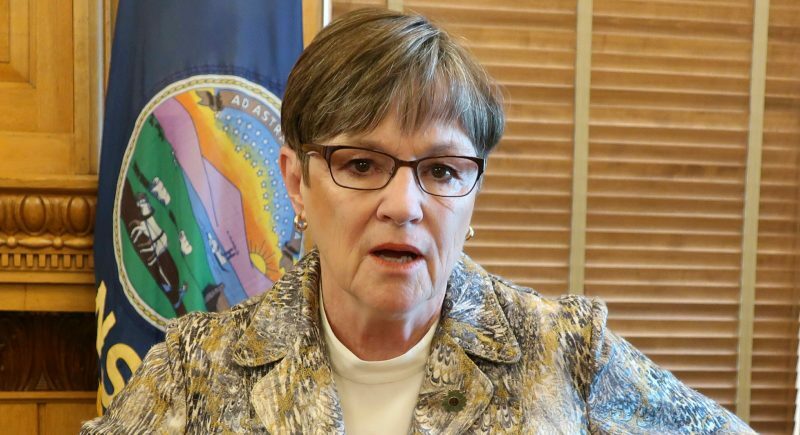 “Small business, which accounts for most employers in this state, are overwhelmingly in favor of eliminating the income tax on the many business entities which are organized as LLCs, S corporations and sole proprietorships,” Murray said. The new law was the result of a furious legislative battle. Moderate Republicans in the Senate wanted a less aggressive tax cut, phasing in reductions over a number of years. 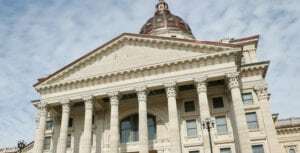 But as a favor to Brownback, the moderates approved a larger tax cutting measure to get a bill into a House-Senate conference committee for further negotiations. The moderates said they were assured that bill would never see the light of day, but Brownback has said he made no such assurance. As the legislative session continued, Brownback asked conservative Republicans in the House to concur with the Senate-approved bill despite the projected deficits. Senate leaders cried foul, but that maneuver put the bill on Brownback’s desk. 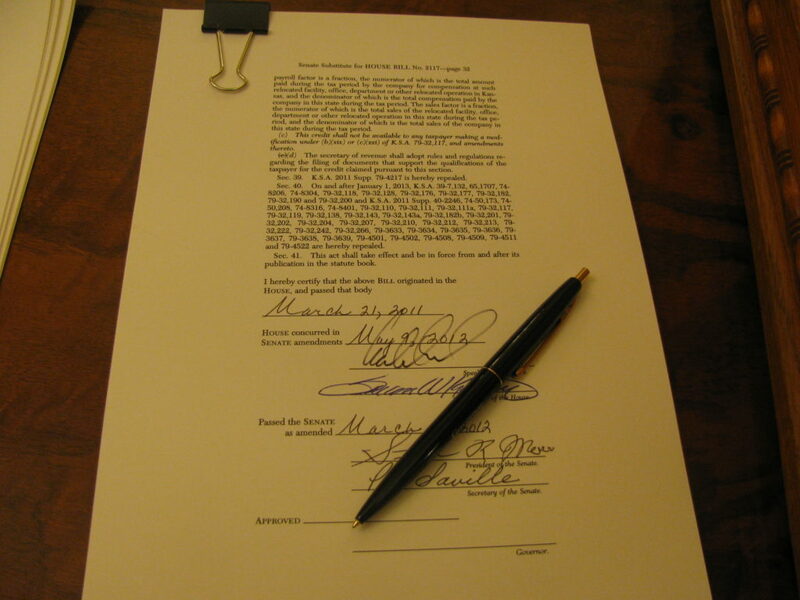 The governor vowed to sign it as further negotiations failed.